The first reviews of the new MacBook Pro with Retina Display are out and to no one's surprise, the Retina Display is ah-mazing. We'll have our own review of the new MacBook Pro soon, but in the mean time we culled together the best first impressions out there. All of these components translated to a blazing benchmark performance. On Cinebench 11.5, the new MacBook Pro returned a CPU score of 6.12 points. The 13-inch MacBook Air scored just 2.09 points on the CPU test, so we're talking 3X the performance. 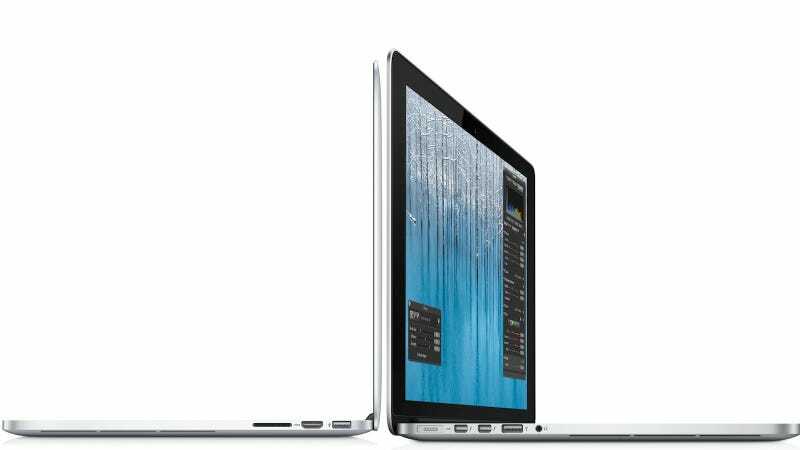 The last-generation 15-inch MacBook Pro scored 5.41, or about 18 percent slower. On Geekbench, the MacBook Pro scored 11,049, beating the Acer Timeline M3 by a wide margin (6,017) as well as the last-generation 15-inch Pro (10,874). The Alienware M18X we reviewed last year registered 9,458, while the more recent MSI GT60 got 10,854. So you know it's a good sign when this notebook is surpassing full-fledged gaming rigs. In practice, there proved little we could do to trip the new MacBook Pro up. Apps load with alacrity, on-screen and ready for action even before the icon has finished its bouncing, and playing back Full HD video – something you can do in a window at full resolution, given the pixels on offer – while simultaneously browsing and rendering video in iMovie didn't see the notebook miss a beat. It's the Retina display that makes it unlike any other personal computer that Apple or anyone else has released. As on the iPhone 4 and 4S and the new iPad, Apple upped the screen resolution to the point where the individual pixels are indistinguishable. The Pro's resolution of 2800 by 1800 pixels isn't merely impressive for a 15″ laptop; it's unprecedented. It's four times more than the old-style 15″ MacBook Pro, and nearly five times as many as the standard display on HP's suspiciously MacBook-like Envy 15 laptop. Even beyond the record-setting resolution, this is an exceptional computer display. It's got less glare than previous MacBook Pro screens. Contrast and viewing angle are both outstanding. Videos, photos and text benefit from this astonishingly sharp screen. But keep in mind that your programs won't look any sharper until they're updated for the Retina screen. The standard Apple apps have been updated, or will be shortly: Safari, Mail, Aperture, iMovie, Final Cut, iPhoto. Updates for Photoshop and Autodesk are on the way. Even in most nonupdated programs, menus, dialogue boxes and typed text get sharpened automatically. But in a few programs, text looks jagged and awful on the Retina screen. Screen notwithstanding, the most impressive feat is how small and light the MacBook Pro with Retina is. At .71 inches thick uniformly, the MacBook Pro with Retina display is just a hair taller than the .68-inch (at its thickest) MacBook Air - though in practice, we found the Air to stand actually a little taller on a table when side-to-side because of the shorter rubber feet on the bottom of the new generation Pro. Compared to the traditional 15-inch MacBook Pro, the Retina model is about 25 percent lighter (4.46 vs. 5.6 pounds) with about 37 percent less volumetric footprint. With the screen at 65 percent brightness, the laptop's large battery still lasted six hours on a charge. I was able to work on the laptop for an entire 5.5 hour flight from San Francisco to Newark, and still had 20 percent left when I touched down. On a more grueling video playback test, which loops the same HD video clip, the laptop lasted 5 hours and 22 minutes. That's longer than most Windows 7 ultrabooks, though not as long as the 13-inch MacBook Air, which lasted an hour more on that same test. Still, it only took a few minutes of hacking and slashing to get the bottom of this unit warm, and then noticeably hot. That, of course, caused the redesigned fan system to pop on, which draws in air from a pair of vents on the left and right sides of the bottom of the chassis and blows it out through the hinge. It's been optimized to create a less obnoxious sort of whirring noise. Indeed it's a subtle and unobtrusive white kind of sound, but it's definitely not silent. In fact, the fan doesn't sound particularly different than that on the current MacBook Air, though a few decibels less obtrusive.